Since New Labour came to power in 1997 corporation tax has been reduced from 33%, to 31%, then to 30% and two years ago to 28%. LEAP estimates that these tax cuts have given an extra £50bn to big business in the last 13 years. This of course excludes the lovely donations that New Labour made on all our behalfs to the banking sector. £50bn over 13 years may not seem much in the context of a £178bn annual deficit, but the difference last year between 33% and 28% would have doubled the higher education budget. Cut now or cut later? 80 economists have it wrong! The letters in today's Financial Times from a combined sixty economists are a welcome rebuke to the nonsense from 20 mates of David Cameron's (aka leading economists writing in the Murdoch press). "immediate cuts - even supposing they are practicable - would not produce an offsetting increase in private sector demand, and could easily reduce it." "Britain's level of government debt is not out of control"
"In urging a faster pace of deficit reduction to reassure the financial markets, the signatories of the Sunday Times letter implicitly accept as binding the views of the same financial markets whose mistakes precipitated the crisis in the first place!" The problem though is that both letters back cuts* - they simply argue about timing. The solution to this crisis would be to collect the taxes that are currently going uncollected, evaded and avoided - as much as £120bn a year. Then bring the banks into public ownership and invest their profits in public services. Update 22/02: TUC now calling for petition to Darling and Osborne against 'premature cuts' in new press release. This is supported by the Fabians and others. Inflation figures out yesterday showed inflation had risen to 3.5% on the CPI measure and 3.7% on the RPI measure. As LEAP research published in September 2009 showed, inflation tends to hit the poorest hardest. All parties are threatening public sector pay freezes, and a freeze in the National Minimum Wage has been called for by the Association of Convenience Stores, British Chambers of Commerce, and by CIPD. Let's be clear a freeze means a cut. In real terms, a freeze would be a 3.5% cut. Thankfully, at the 2009 TUC, USDAW (not the most radical of trade unions) passed a motion calling on the Low Pay Commission (LPC) - of which the TUC is a part - to "significantly increase the National Minimum Wage". The motion also called for the full NMW to be payable from 18 (currently those aged 18-21 are paid a lower rate). So when the TUC made its submission to the LPC what sort of significant increase did it call for? 20p. Yes the TUC - "the voice of Britain at work" - with clear Congress policy for a significant increase instead calls for the minimum wage to be increased by just 20p from £5.80 per hour to £6.00. The CBI, BCC and FSB must be laughing their arses off. We know they will call for a minimal increase and the LPC will settle somewhere in the middle. 20p by the way is 3.4% - around or slightly lower than many experts believe inflation will average this year. So the "significant increase" is a real terms freeze. And what of applying the NMW to all from 18? No, the TUC submission advocates all three age discriminating bands remain and all increase by 3.4% - so young workers won't even catch up. Last Friday even New Labour was floating "a pledge to raise the minimum wage sharply" in the Independent. What incentive is there though for Brown to take a radical turn when even the TUC is not calling for a sharp increase? "The inflation message is don't panic. The rise today has more to do with what was happening a year ago than anything new in the economy, and is likely to fall back to its target range in due course." "Don't panic" - wasn't that the refrain of the ineffective Corporal Jones in Dad's Army? Left economists have derided a bid by top Barclays chiefs to defuse public anger over the banking crisis by waiving their own bonuses - pointing out the firm's president was already sitting on a £22m share deal. After reporting higher than expected profits of £11.6bn for 2009, Barclays announced its bankers would be rewarded with £1.5bn in cash bonuses and £1.2bn in long-term awards. However for the second year running chief executive John Varley and president Bob Diamond said they would not take part in the cash bonanza. The Left Economics Advisory Panel (LEAP) stepped in on Tuesday to slam Mr Diamond over the millions he has earned from selling shares in Barclays Global Investors. A LEAP spokesman said: "The hubris around the supposed modesty of Bob Diamond in refusing his bonus is somewhat undermined by the fact that he received £22m in share sales this year on top of his alleged eight-figure salary." The average bonus at the bank's investment arm BarCap was £95,000, while elsewhere in the company bonuses were around £19,000. And it is predicted that as other banks announce results over the next fortnight 10,000 City workers will rack up pay and bonuses worth over £1m each. The LEAP spokesman said the massive profits and bosses highlighted "the failure of governments to change the culture of the banks." Mr Varley said he had reduced the bonus pool to pay for the government's 50 per cent tax on bonuses over £25,000. Barclays alone handed over £225m to the government out of a £550m sum Chancellor Alistair Darling expected the tax to raise from all banks. But some pundits argued that more public finances could be raised through a transaction tax which would enable the taxpayer to see a share of Barclays gross assets of £1.4 trillion. Communist Party of Britain general secretary Rob Griffiths asked: "How can it be right that a banker speculating with other people's money can receive more in annual bonuses than a hospital porter or a bus driver can earn in a decade?" "I think the tax has a lot of problems at a lot of levels. First, it needs international agreement – most of these transactions are also off market – on unofficial over the counter (OTC) markets which are currently unsupervised. Far from curtailing banks from speculation it would push banks from a low margin execution business for pension and insurance funds where the margins are thin (we would end up paying through increased fees on running our pension/insurance funds) to trading for the Bank’s own account (speculative proprietary trading with high returns). Brown and co know all this and that it will never be implemented. He is using it as a bit of Bank bashing ahead of the election. The real way would be to tax the banks investment banking profits and hit the high earners with a 100% tax above £100,000. Of course really taking over the banks and using their tens of thousands of billions of pounds of assets for social use and closing down all their speculative businesses and turning their lending into social rents is the real way ahead. The Robin Hood Tax campaign is becoming a substitute for real action and something Brown and co can hide behind." For those who haven't seen it here's the launch video, more details on the Robin Hood Tax campaign website. Ancient Greece was the birthplace of democracy - the word coming from two Greek words demos (meaning 'the people') and kratos (meaning 'to rule'). It was very clear this week that in modern Greece the people certainly don't rule, though they are fighting back. By joining the Eurozone, Greece is subject to the Growth and Stability Pact (meaning its deficit cannot exceed 3% of GDP) and its currency is run by the European Central Bank (ECB). As a relatively minor economic force what hope have the people of Greece got of the ECB taking decisions in its favour? In short, freeze public sector pay, cut public sector jobs , make people work longer, raise regressive taxes. Yes, the EU's solution to the crisis of neoliberalism is more neoliberalism. There are lessons for the UK here too - our deficit is about the same as that of Greece (12.5% to 13%). If the UK was in the Eurozone we might be having austerity packages imposed on us. As ever with the UK though we don't wait to have economic stupidity imposed upon us - we have three political parties fighting a general election on so far mystery austerity packages (cuts: bold, swingeing or savage - the choice is yours!). All three political parties and all the bosses' organisations are uniting to ensure you won't get a pay rise this year. All of them are calling for pay freezes to differing extents: Labour, Conservative, Liberal Democrat, CBI, IoD, BCC. The false divide created between public sector workers and private sector workers is nonsense. This is about making ordinary workers no matter which sector pay for the crisis. Meanwhile the bonus culture continues in the banking sector and the UK remains the most unequal its been for three generations. Research published today by the Labour Research Department (LRD) shows that "a third of all pay deals now included a pay freeze - the largest proportion since the recession began". This is very bad news. Inflation is currently 2.4%, expected to average over 3% this year and peak at over 4% in the summer. Therefore a pay freeze is a real terms pay cut. And as LEAP showed last year, in our Inflation Report 2009, inflation is often highest for the lowest paid. The effect of the contraction in wages and rising unemployment last year is shown in the number of personal insolvencies, rising to 135,000 in 2009 - an increase of 26% on 2008. Lewis Emery, LRD report author, says that "Maintaining jobs and business continuity is a greater concern, both in the private and public sectors, but with inflation at 2.4% pay will not be neglected either." Unions and workers certainly cannot afford to ignore pay - especially for the lowest paid. And any Government wanting to address the crisis needs to move away from the rhetoric of pay freezes and start raising pay significantly to stimulate demand and avoid mass mortgage and loan defaults causing another bank collapse. 9 Feb Update: The Daily Telegraph reports that more than 1.4 million households were visited by bailiffs collecting unpaid council tax bills last year. This is a rise of 700,000 in just three years, and a 69% rise since 1997. 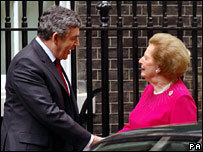 Despite welcoming her to 10 Downing Street within a few weeks of becoming Prime Minister, Gordon Brown (as an opposition MP) once railed against Thatcher's "dishonesty" over unemployment figures. Looking at comparative statistics though between the ILO unemployment measure and the claimant count (those actually receiving jobseeker's allowance or unemployment benefit as it was) in the mid-80s, early 90s and now reveals how much New Labour's 'welfare reforms' have kept people from successfully claiming. While it is true that unemployment (on the ILO measure) is currently about half a million lower than in the previous two recessions (2.5m rather than 3m) it is revealing to know what percentage of those deemed unemployed under the ILO measure are receiving unemployment benefits. In the mid-80s it was 94%, in the early 90s it was 97%, today it is just 65%. So in effect there are today over 800,000 who are unemployed who - for whatever reason - are not claiming jobseeker's allowance. While New Labour should be pleased that unemployment has not (yet) hit the heights it did in previous recessions, it should be intensely concerned at the missing 800,000. Energy regulator Ofgem has warned that the current free-market model for the industry is not fit for purpose and could lead to supply shortages and spiralling fuel poverty. Following an extensive consultation period, the watchdog unveiled a set of radical proposals for a "secure and sustainable" energy supply across Britain. It acknowledged that sticking with the current market was "not an option" - barely two years after it declared privatisation was working - and hinted at nationalisation as a possible solution. The report expressed "reasonable doubt" over the security and sustainability of the country's power supplies amid a perfect storm of the financial crisis, environmental targets, dependency on imported gas and the closure of ageing power stations. It warned that failure to reform the energy system could mean power shortages after 2015, while inaction would lead to a "degree of crisis" in three or four years. Ofgem has predicted that average household bills could jump as much as 25 per cent to nearly £2,000 without urgent action. "The higher cost of gas and electricity may mean that increasing numbers of consumers are not able to afford adequate levels of energy to meet their requirements," the report stated. Ofgem put forward a range of proposals it claimed would help release the estimated £200 billion Britain may need to invest by 2020 in order to ensure future supply. The most far-reaching of these was a call for a "dramatic move away from competitive markets" and towards the creation of a central energy buyer that would set the amount and type of new power generation needed. In short, the government could be forced to reverse Margaret Thatcher's privatisation of the energy market and renationalise the industry. The report was endorsed by left economists, environmentalists and union leaders. Left Economics Advisory Panel co-ordinator Andrew Fisher called for "renationalisation without compensation" and to use the surplus to secure the investment needed for publicly owned supplies that are sustainable and affordable. "The major investment work needed has not happened despite years of massive profits and will not happen in the future," he stressed. "The only solution is full nationalisation. The private energy companies have been ripping off consumers for long enough." GMB national officer for utilities Gary Smith said that the report was "a death knell to the liberalised energy market. We now need the political courage to grasp this and look after people's needs." And Friends of the Earth executive director Andy Atkins made the case for more substantial investment in renewable energy to protect the planet and our future. "A commitment to radically reform the energy system must be a significant element of all the political party manifestos," he added. Energy and Climate Change Secretary Ed Miliband insisted that the government was "confident" of meeting energy supply needs until 2020. But he admitted that Britain would need more "interventionist energy policy" to deliver secure and sustainable supplies beyond 2020.